Five years after the Dawlish rail line was washed away the pressure is growing on ministers, who are accused of delaying a funding package to protect the line. The line, which runs close to the sea, links Devon and Cornwall to the rest of the UK, has proved vulnerable to flooding and storm damage in recent years, most notably on 5 February 2014, when the track itself was washed away in a storm. A cross-party campaign group called the Peninsula Rail Taskforce, has outlined a need for billions in upgrades designed 'to deliver over £8.4bn in economic benefits over the next 20 years'. However ambitions to secure funding even for the most critical works in Dawlish have stalled for years, let alone the cash to shave a modest 15 minutes off the 2 hour 30 minutes journey from Paddington to Plymouth. Not to mention the region has been waiting since the 1930s for the Dawlish Avoiding Line - a detour passing inland behind Dawlish rather than along the coast. 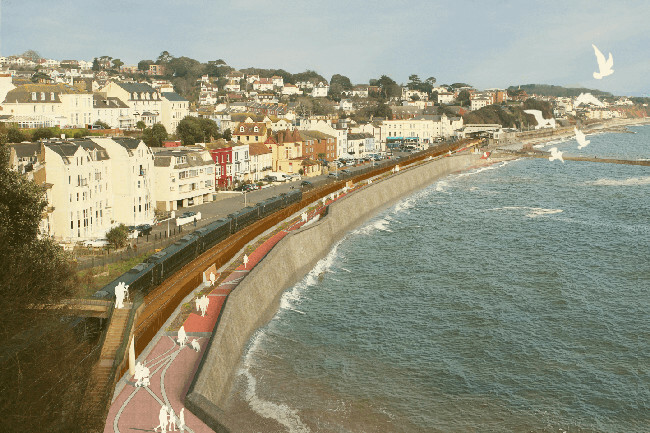 Network Rail has now made a planning submission to Teignbridge District Council for ‘prior approval’ under its permitted development rights, allowing the council able to formally consult the local community on the proposed designs for a new sea wall (pictured) at Dawlish. It said its plans for a higher wall, developed in partnership with ‘world leading’ engineering contractors Arup, are ‘targeted at providing greater resilience for generations to come’. It has however ruled out building a replacement or back-up line inland. A local MP criticised the Government for failing to confirm funding for even a small part of a package identified by Network Rail as needed to improve the resilience of the line between Dawlish and Teignmouth. Following a parliamentary debate on Tuesday morning, Luke Pollard, Labour MP for Plymouth, Sutton and Devonport and shadow fisheries, flooding and water minister, criticised rail minister Andrew Jones for failing to announce funding for the works, describing the situation as a ‘shambles’. My message to the Minister really is simple in relation to Dawlish: Where is the money? Where is the money? Where is the money? Five years on from the storms at Dawlish why didn’t the Government use this anniversary to announce the funding we need for our trainline? Mr Pollard told Transport Network: 'There was a £300m plan [at the DfT]. I think the package will be much smaller around £80m - £100m. We know they are ready to launch it, we know they have the press release ready to go. Ministers have spoken to local Conservative MPs. Why haven't they announced this on the fifth aniversary [of the line washing away]? 'I honestly expect an announcement in the next couple of weeks from Chris Grayling. And the question will be: "Why didn't you announce this earlier?" We have spoken to Network Rail and they are just waiting for the funding to be released. Mr Pollard added that Labour had made a £2.5bn pledge to upgrade the line. A spokesperson for Network Rail confirmed that it is awaiting a funding announcement for the first phase of works at Dawlish, costed at around £30m and due to take place this year. Network Rail plans further, uncosted, works between Dawlish and Dawlish Warren, as well as above Parsons Tunnel, and on the line between the tunnel and Teignmouth. It has made a series of detailed studies ‘which established that maintaining the current railway route was the most feasible and cost effective solution’ and subsequently identified the areas that needed most urgent attention – including the Dawlish sea wall. Based on these studies, ministers allocated £15m to appoint coastal, tunnel, cliff and railway engineers to undertake detailed marine and geological studies to develop plans for the three areas. It said it will provide ‘far more protection’ from waves and extreme weather and is ‘future-proofed’ to protect the railway and the town, taking into account predicted rising sea levels. Mark Langman, Western route managing director, said: ‘From blank page studies that looked at all options we’ve identified this as the most feasible rail route for Devon and Cornwall and there are areas that specifically need our attention. 'Improving the resilience of the sea wall at Dawlish is one of the most immediate and easiest areas we can begin work on. These plans are now subject to the views of the council, their residents and a final decision from government.